When winter comes to Cache Valley, where I live, it provides some amazingly lovely scenery once in a while. I like this scene, but you can see the mist around the trees and the clouds in the sky. This is in reality pollution. The temperature drops during an inversion and a high pressure weather system stays for long periods of time. No wind blows, so the air just stays around. As we drive or use other gas-powered equipment, the pollution from these machines stays too. This photo was taken after about 2 weeks of inversion. It cleared up a few days later. It's actually not a fun time, but I'm glad I happened upon this road when it did. A pleasant almost symmetrical composition! Different layers work fine in creating a feeling of depth, and the silhouetted trees add to the beauty... Nice work! Hello David, Nice to meet you! Mood is great & well set in Navy blue tone. Love the line work it form! Thanks for sharing. Beautifull misty shot. I really like the different lines of the ground, trees and mountain. The color and frame are giving it a great atmosphere. It is beautiful David though cold and forbidding. It is interesting the way the tree silhouettes have 'acquired' the halo. Nit pik... maybe horizion bit tilted tends to detract even if this was how it was if you know what I mean. What a stunning view. The way you present us with arow of wintery trees as a foreground to that landscape is awesome. Well done and thnx for letting us drool over this one. Superb photograph! Great composition with slight tilt on the horizon that could be adjusted about less than one degree. The visual here is stunning. The reality of your note about pollution is unfortunate for this is the world we inhabit! Lovely tones and great mood! Good pp work, & a marvellous tonal range, with superb graphism. Congratulations! Excellent shot and well done on the composition. Nicely done and it's beautiful. Superbe image, la cime des arbres suit la courbe de la montagne! La brume rajoute un effet surprenant! What a nice silvery image, it's almost glittering and looks really dreamy. It is also nicely framed. I like how everything seem nicely put on center. Lovely mountain and what nice row of tree silhouettes. Very nice view! The mist is great! I enjoy how you catch... So rich in blue/grey tones! fantastic morning view and fog effect. Tone soft and contrasts are beautiful. The atmosphere is absolutely fantastic. Composition is excellent. Nice shot. PRECIOSA! Nice shot! Beautiful image, great photo, excellent work! and many thanks for sharing! this shot is great! I like the silhouette of the mountains is like the silhouette of the trees. The tones are excellent and all the compo! Lovely picture. The colours, the composition, and the mood. All great. I like the grey tone and the contrast there!Great composition too.I believe that If there is a risk, there will be a chance too.I hope that you understand my poor English. Excellent capture Dave. The foreground texture combined with the receding layers gives good depth. Nice work. Excellent shot David. I like to see the tree line growing in harmony with the mountain's height in the background. Beautiful duotone and nice soft image. The blue tones are amazing. Beautiful view with a great composition. I like the layered look. Sorry my last points went to your other photo. This shot is simply... awesome! The mountain's form is almost replicated in the clouds and the trees. And the colours tones are "layered"! It's one of these shots I'd frame and hang on the wall!!! Very nice picture in black & white,great composition ,realy a good catch and beautiful landscape..Well Done..
wow what a mist ! great compo and shot ! 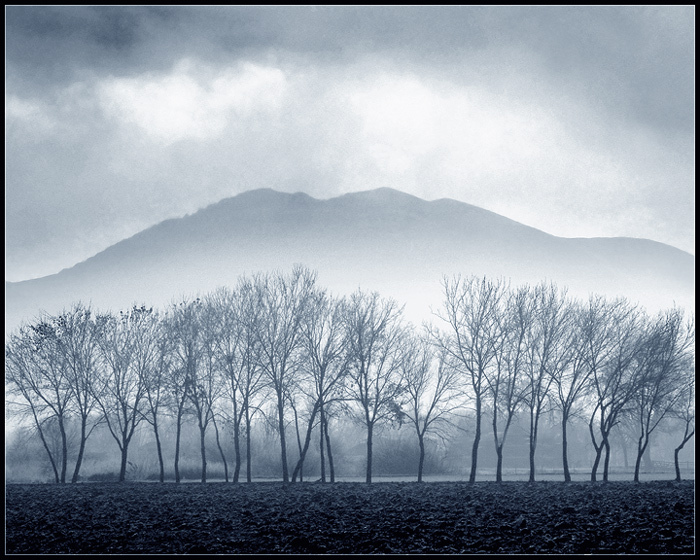 Good composition, and very effective, I like the way the curves are repeated in the trees, the hills and the clouds. Nice photo! What a wonderful atmosphere, excellent work. It is so sad that pollution can make such a nice picture. Great composition with all the difference of tints. Spectacular landscape, I like how the mountains grows to the center, engulfing the tree line. Nice and delicate cold tones, gives a chill and lonely sensation. Nice work! Good color, depth and POV! I like the sharp outlines on the trees, bushes and mountains. I think you took the picture on a slight tilt, but that's only a minor problem, and it might just be me. Otherwise, excellent! Beautiful picture - composition is superb and the different elements give the feeling of depth to the subject. Colours work well with the mist, I can almost smell the mist in the air! A lucky man to see and make this David,supershot! Really pretty. Well framed, lovely symmetry, and silhouette.